"What?! The race is when?... This weekend?" It happened again. Last year I didn't even know there was a Marrakech 10k race until a few days before a friend called me up to ask if I was going to be running it. That's the way races seem to often take place here. There usually isn't a whole lot of promotion or advertisement for a race until a few days prior. So this year I was ready for the Rahal Marrakech 10k 2014, I knew when it was and was already working out how I wanted to run it... or so I thought. Some how I ended up being a week off as to when I thought the race was. On Friday afternoon, I went downtown to Guiliz in Marrakech to sign up. This year they were already beginning to set up the start/finish area two days before rather than doing last minute setup. While knowing when the races are here may be a little difficult, registration is always so easy. All it took was going up to the registration tent, taking two minutes to fill out the information form and paying. After that I was all set, I had my race t-shirt and bib number. Now all that was left was to wait for Sunday Morning. Sunday morning came around and sInce I wasn't going to be running with any friends this year I had plenty of time to get up and ready. I showed up with about 20 minutes to spare. After walking around for a few minutes and watching a fun group stretching session similar to the one I had witnessed last year I did a short jog and then lined up for the start of the race. This year I was ready to "race" or at least race my time from last year. I had set a PR last year so I was ready for the challenge. The race gun went off as it always does here, without an audible countdown or warning, something I have become accustomed to. The 10k starts out by going straight out of the center of town, past the train station and into a residential neighborhood. This is great since people line up where ever they want and there are lots of slower people in the front and faster people in the back. So, since the race goes straight for about a mile and a half before its first turn there is plenty of time and space on the wide roads to make your way to the ideal place in the pack. At mile two the race runs into the Menara Gardens and this is also where we got our first water station. 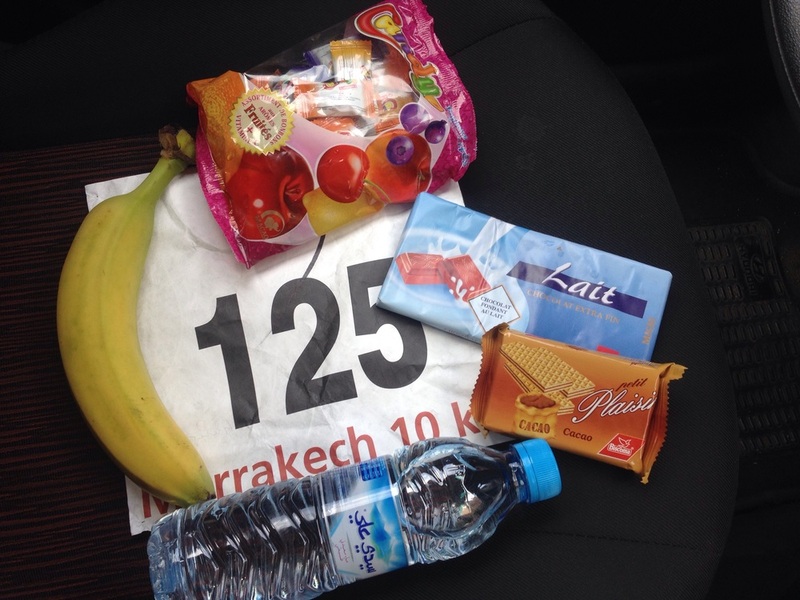 One of the things I love most about the races in Morocco is how they give us water. In America, aid stations always give little paper cups of water. Here in Morocco the races almost aways give out bottled water which is awesome! I know this is not as good for the environment but it makes consuming water in the middle of a race so much easier and you can hang onto it for a little while making it easier to stay hydrated. Once the race exits the gardens its a few miles of nothing except for the 5k timing mat. Eventually theres a left turn and everyone gets a chance to run next to the old city walls for about a mile and then its just a few more turns until the finish line. Since my race goal was to beat last year's time I was not too focused on the race itself. These are a lot of the same roads I often run on for training so I focused mostly on my watch and maintaining the right pace. I did get to talk to a few people along the way and as is the case most of the Moroccans I talked to that were passing me were guys who either rarely run or just run when there are races in town and every time I hear this I feel so... genetically wronged. But I guess that is part of what makes running so enjoyable, everyone has their own challenges to overcome and for some of us that challenge is that we were birthed with the slow trait. Turning the final corner I saw the finish line a quarter mile off. This was a perfect spot to give that last kick of speed and I crossed the line knowing I had tried my hardest. As I came across the finish line I realized that I not only beat my time from last year but I did so by quite a bit of time. Last year I ran 43:57 and this year I ran 42:25! I was so happy with my time. I ran the exact pace I was aiming for and everything about the race went perfectly for me. Not only did I have an excellent race after crossing the finish line An getting my metal I was given a swag bag which was a first for me at a race in Morocco. The 2014 Marrakech 10k was an awesome experience. It seems that with every passing year these events get a little better and more organized. If you're in Marrakech in 2015 around the first week of October this is definitely something that you should plan to do. The weather is usually perfect about that time of year and there are fast and slow people all running the race so don't think you will end up being left behind. If you have done the race before or plan on being here for the race next year let me know in the comments below. Posted on November 2, 2014 by Jonathan W.